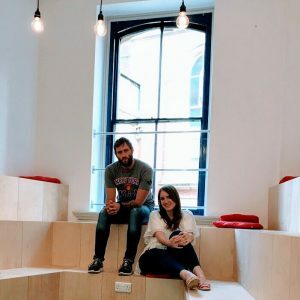 Crowdfunding agency Nuuk has relocated from Dublin to Accelerate Places on Princess Street in Manchester and is targeting a turnover of £500,000 for 2018. The agency was set up in 2015 by Slovenians Lina Gantar, 28, and Luka Cvikl, 29, and has a staff of six. It claims to have secured more than $13million for 40 start-ups and to have a 98% success rate. Gantar said: “Latest figures show that crowdfunding is a $34.4bn industry, which is expected to surpass venture capitalism by 1.8% this year. However, not all applicants are successful and there’s a real skill to being selected - it’s vital to seek expert support to ensure success. Cvikl added: “We’ve purposefully formed quite a niche offering – as the popularity of crowdfunding grows so too does the demand for dedicated, expert support to attain it. Additionally, we see a big increase in the demand for go-to-market strategy, which is what crowdfunding essentially is, so we can apply our crowdfunding expertise to other industries as well.